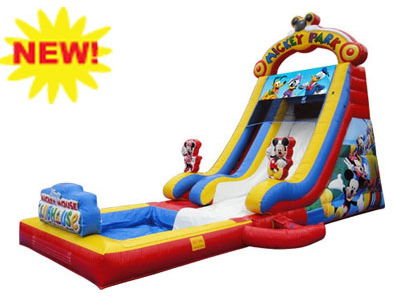 Our 18' High Mickey Park Water Slide is a very popular slide for kids of all ages! Slide away with Mickey Mouse and his friends in this Mickey Park Slide. Features climbing area, slide with water mister and a nice big pool at the end. This beautiful Mickey Park Water Slide features images of Mickey, Minnie, Donald, Daisy, Goofy and Pluto. Due to the size of this unit it is not available for customer pickup for safety reasons.